Then-athlete Jessica Zavolta, ‘18, embraces teammates after a home game against Ohio Wesleyan University on April 22, 2018. 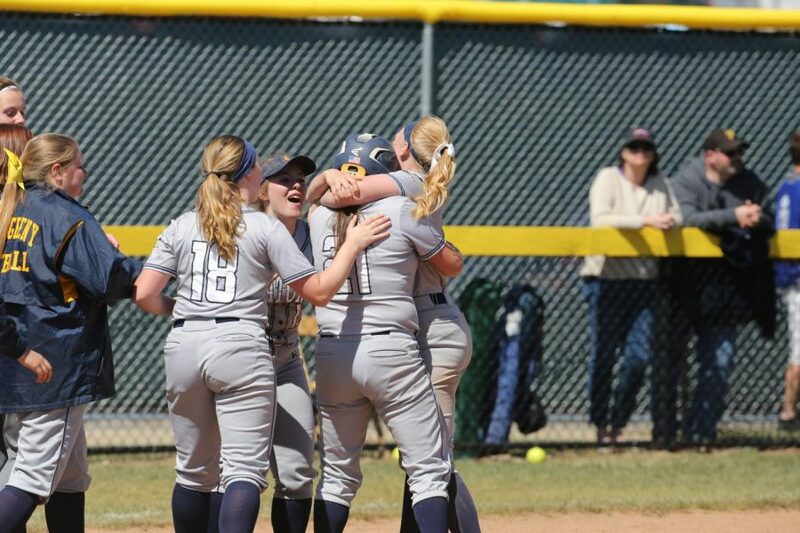 New Assistant Women’s Softball Coach Jessica Zavolta, ’18, will become part of a group of Allegheny athletes who have returned to their alma mater to coach the sport they played as undergraduate students. Zavolta’s hiring was announced in July of this year by Head Coach Beth Curtiss, whose previous assistant coach was also an Allegheny softball graduate. Curtiss said Zavolta’s particular expertise in catching and pitching made her a natural choice for the position. Zavolta was a first team all-NCAC pick in her senior season as part of the 2017-18 Gator team that reached the NCAC Championship Tournament. A team captain for three of four years at Allegheny, Curtiss said Zavolta’s leadership was a valuable part of the team’s success and will help to ease the transition from teammate to coach. Zavolta said she anticipates a smooth transitio. Softball Team Captain Samantha Valera, ’20, is eagerly anticipating working with her former teammate. Curtiss said Zavolta will have an advantage in the recruiting process because she will be able to provide in-depth information on Allegheny and share her experiences with potential prospective student-athletes. Zavolta is the fifth member of the current Allegheny athletics coaching staff to return to work at their alma mater. Head Cross Country and Track Coach Ben Mourer, ’07, Assistant Golf Coach Abby Sorensen, ’12, Head Women’s Lacrosse Coach Ashley Hughes, ’08, and Volunteer Assistant Swimming Coach Rebecca Dawson, ’00, are also graduates of the programs for which they now coach. Mourer, whose wife is also an Allegheny alum, said his personal experience with Allegheny made him eager to join the staff. Sorensen said her own personal experience made the transition into a coaching position as smooth as the experience Zavolta anticipates. Sorensen was part of three rosters that qualified for the NCAA Division III National Championship in her time at Allegheny. She said she was eager to accept a position working under Head Coach Jeff Groff. “I knew him so well, obviously, having been my coach, and obviously respected what he had done with his program and his style, and I was just really, really happy to be able to recruit at a school that I believed in,” Sorensen said. Curtiss said Zavolta’s experience working with her as an athlete will translate well to working with her as an assistant coach. “She knows me really well, and I think that she can help some of the new players transition in and give them a little bit of guidance that will be helpful because I think that she knows how the program works,” Curtiss said. Hughes said her particular experience with year-round training as an Allegheny athlete helped her to prepare to ease the transition of her players. Hughes was named to two Intercollegiate Women’s Lacrosse Coaches’ Association All-Region teams as a Gator and is currently third on the all-time career goal list and points list and is second in assists. 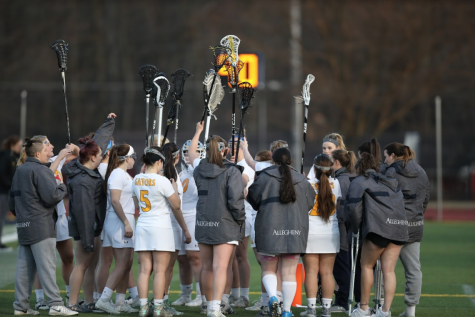 Despite her successful career, Hughes said she is even more motivated as part of Allegheny lacrosse in her current position. Hughes, who recently finished her fifth season coaching at Allegheny, said she left Allegheny with hopes to return as a coach. While her return came sooner than anticipated, Hughes is also enjoying being part of the changing landscape of Allegheny College and Allegheny athletics. Mourer said one of the things he enjoyed most about returning as a coach was seeing the way the best parts of the cross country and track team culture had remained a part of the Allegheny experience. Mourer was part of four conference championship-winning cross country teams as an Allegheny athlete. He was also part of four indoor and outdoor track conference champion teams, totalling 12 conference title-holding teams in all. He considers his time at Allegheny to be an advantage as a coach. Dawson said she has seen positive change in both Allegheny and in her sport between her time as an athlete and her time as a coach. Dawson earned 15 All-American titles as an Allegheny swimmer and was inducted into the Allegheny College Athletic Hall of Fame in October 2016. Dawson said Division III swimming has become much faster and much more competitive. Dawson has seen the broader athletic experience change in her time at Allegheny as well. Reflecting on her positive experience drives her to be a positive part of student athletes’ time at Allegheny, according to Dawson. “I look back at being able to swim here, compete at such a high level and get the education that I did, and it’s an experience I wish everyone could have,” Dawson said. Sorensen expressed a similar hope for her own athletes and prospective student-athletes. “I was just really happy to get the opportunity to recruit golfers who could hopefully have the same or better experience than I did at Allegheny,” Sorensen said. Dawson said the opportunity to become a Gator again is a unique and special experience.